2019 Canada Government Paper Money 31st Edition. 2019 Canadian Collector Coins Royal Canadian Mint Issues Vol 2, 9th Edition. 2019 Charlton Coin Guide 58th Edition. Canadian Bank Notes, 9th Edition. 2019 Canadian Coins, Vol 1 Numismatic Issues, 72nd Edition. The only book on the market to comprehensively cover world coins of the 20th Century, the most widely collected and sold genre in the hobby. Contains 60,000 actual-size images for easy identification and globally accepted KM reference numbers, which are critical for identification. 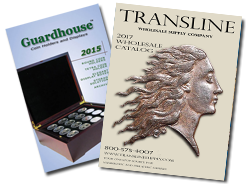 This massive catalog has current market values for coins in at least five grades, all determined by an international panel of coin experts. What's it worth? A complete listing of canadian and US gold and silver coins and what dealers are willing to pay you for them. Charlton Press has released the 29th edition of their popular 2017 Canada Government Paper Money book. Author: R.J. Graham. The updated reprint of The Bronze Coinage of Great Britain(2nd edition, 1985) is the most complete standard reference catalogue ever published on pennies, halfpennies and farthings, from the introduction of British bronze coinage in 1860, the year in which the popular and well-known Victorian 'bun' head issues appeared, up to and including the decimal coins of today. Full descriptions and over 280 detailed photographs make identification of every known variety simple.